Dark mission: Escape from the forest! 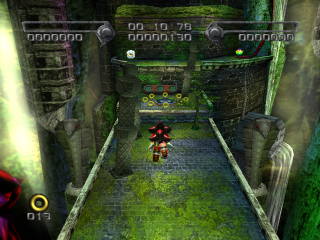 Death Ruins one of five possible fourth levels of Shadow the Hedgehog; in the game's branching path structure, it follows taking a highly heroic, G.U.N. / Sonic-aligned path through the previous levels. Thanks in part to Shadow's help, the Black Arms have been driven out of Westopolis and into the nearby jungle, where ancient ruins are overgrown both with terrestrial foilage and the alien's massive crimson flora. The huge ancient temples feature many wide bottomless pits, and grindrail sections around spiralling pillars. Shadow must make repeated use of the red fluid trails to pass round GUN's fortifications. The first of the 'Pure Hero' levels, Death Ruins is only accessable by taking Tails' good route in Circus Park - helping the fox pilfer Dr. Eggman's ill-gotten rings. Despite all the assistance Shadow has given GUN in this and previous levels to reach the Pure Hero path, the GUN Commander remains unswervingly convinced of the hedgehog's evil intent, and instructs his soldiers to use all tactical weapons in hunting him down. On arriving in the heavily terraformed Death Ruins, Shadow runs into Rouge, who today is putting her secret agent duties on hold to join the regular GUN army in blasting aliens. The Black Arms appear to be on the run, although Doom's Eye tells a different story - insisting their retreat is simply a tactical withdrawl off the surface now the Arms' planetside objectives are complete. The alien leader commands Shadow to simply join his troops in evading the human counter-offensive. Regardless of which path Shadow takes, at the end of the stage Doom makes his first hints at his final plans for humanity, and the associated 'Ritual of Prosperity'. He then sics Black Bull on the Ultimate Lifeform (again), apparently just because he can. This page was last edited on 31 October 2017, at 18:18.